Is is true? Is corporate America finally beginning to understand that it's just as important to keep pets safe in vehicles, as to keep people safe? It isn't JUST because pet parents love their pets - it's also because any loose object (purse, laptop, pet) becomes a projectile in an accident. Even a minor accident. I get really burned when I see people allowing their dogs to sit on their laps when they travel in a car. Seriously, would you put an infant there? Would you disregard safety research and studies and allow your two-year old to ride on your lap in the front seat? Your dog, no matter how small, is the equivalent of an infant or toddler - at least, I think so. 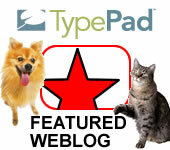 I loved this post on the HIP for pets blog and had to share. You'll need to hop over there to read ALL of it but here's a great introduction. Just to set things up - this is advice on ways to not only make your pet behave in a hotel setting, but how to make your pet comfortable there so you can enjoy the vacation or trip, also. Almost two years ago, Tom and I moved cross-country with Wabby (aka The Grumpy Old Lady). She slept in her cat carrier between us on the front seat of a U-haul. It was an experience, I can tell you that! Moving with just one pet, and a cat, at that...isn't too hard. Wabby is less Grumpy than she lets on. Today, we're settled in our home in CO and we have 3 dogs, along with Wabby. I can only shake my head trying to imagine moving with Chester, Emily and Olive! Just recently, the folks at Apartment Guide contacted me and introduced me to their concept of "A New Place for Your Pet" challenge. It's encouraging to know there's a place we pet parents can go for great advice on moving with our pets - resources like the Apartment Guide. They are so focused on this - they sent me a gift card to help make our current home a real "place for pets" - making life here in CO happy for our dogs and for Wabby. Jane Harrell, of BlogPaws "Be the Change" fame, organized a great event this weekend for the BlogPaws Tri-State Pack. This is a group of pet bloggers who like to get together in person and hang out. What better time of the year than Fall, when it's still sunny and not too cold, and Halloween is just around the corner. The group advocates for pet rescue and adoption have a great time - this weekend they donated 80 pounds of food and assorted items to the NYC Animal Care & Control Center, Manhattan. Dr. Nancy Kay, who writes the fab blog, Speaking for Spot's Blog (named after her also fab book and website, Speaking for Spot), has a good blog post on flying with your dog. She's got a far better title - "Dogs That Fly" - but, the essence is good advice on how to deal with the issue of traveling by air with your dog. Here's why I am sharing this post with you - too many dogs perish when stuck in the cargo area of a plane. We pet people want to bring our dogs with us everywhere because they're part of the family. I always hated leaving Carmie behind when I traveled, but I was assured that she was fine because my son lived with us and he took good care of her. Had that not been the case, I would have hired a good pet sitter. No, I would not kennel her. Well, maybe at PetSmart. They have fab kennels and great help. Yes, I was there. This picture proves it. Mom and Tom took me to BlogPaws. They do not have a picture of me giving them my evil stare - when they put me in the "cat carrier", but I did give it to them, trust me! My cat carrier is okay - I can see out of the top of it. But, somehow, this time, I couldn't see Mom. There was so much other stuff on the seat with me, and I was turned the wrong way...which made my view all blurry. Looking out the top of my carrier just showed me the sky. So, I told her. Over and over, I told her. But, it didn't help. She didn't let me out for a long, long time. Then, we were in a big place that was pretty strange. 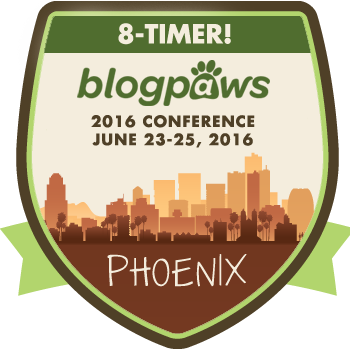 BlogPaws was noisy. Mom thinks I didn't see all the dogs, but I did. Mostly dogs don't bother me - but I wasn't sure what all those dogs were doing, and why I had to be carried around that big room full of dogs, when I was happy in the room with the nice bed. We're still a few days out, but in tribute and honor of our canine heroes, I wanted to share this fantastic video created by Kenn Bell of Dogfiles.